The decorative design of this traditional sofa will have you amazed that it is actually a recliner. An elegant piece with a den-room aura, this three seat sofa features a wing back style with classic rolled arms and nail head trim. Plush upholstered cushions cover this power reclining sofa from the contoured seat to the fully padded chaise and defined headrest. 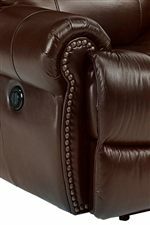 A top-of-the-line craftsmanship from a quality manufacturer ensures this reclining sofas style and most of all its durability. A luxurious piece for decorative family rooms, this reclining sofa features all of the comfort with an unmistakable style. Available in power or manual recline option. The Latitudes - Capitol Power Reclining Sofa with Traditional Furniture Style by Flexsteel at AHFA in the area. Product availability may vary. Contact us for the most current availability on this product. The Latitudes - Capitol collection is a great option if you are looking for Traditional furniture in the area. Browse other items in the Latitudes - Capitol collection from AHFA in the area.